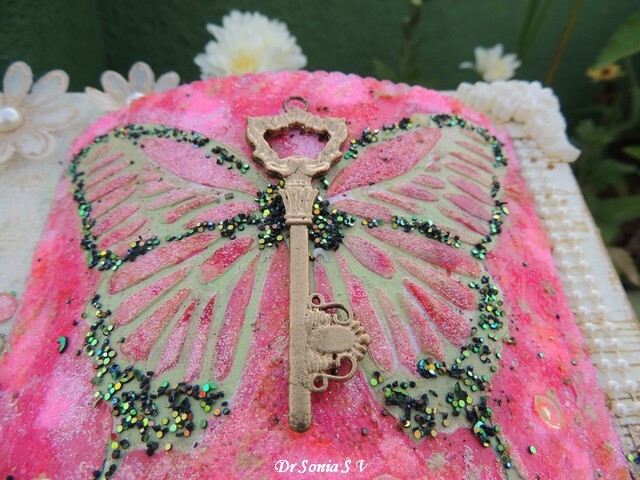 Hi friends, my blogging is pretty erratic these days as juggling so many things right now. 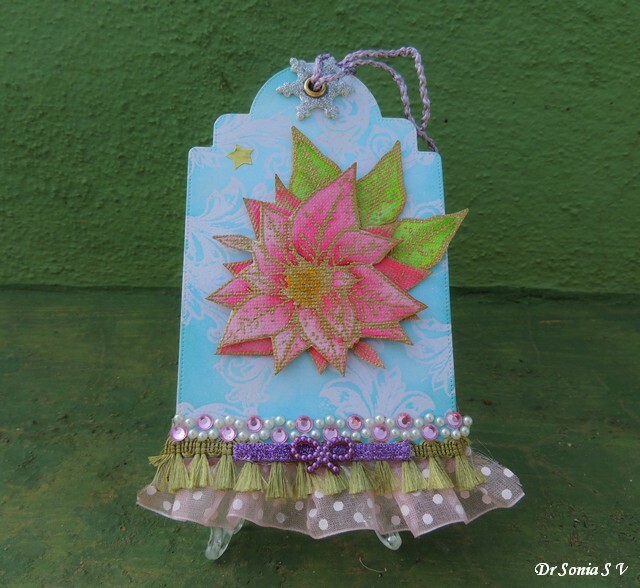 Sharing a mixed media plaque I made as DT project for Crafters Corner to showcase stencilling techniques. 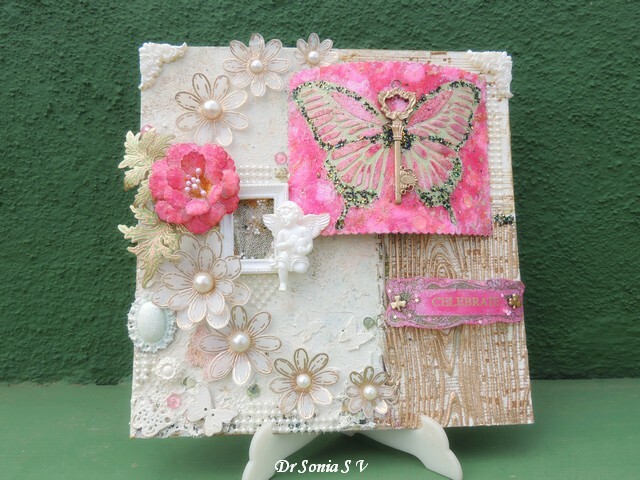 My mixed media plaque celebrates life and enchanting nature with a butterfly and an angel encompassed in a semicircle of soft vellum flowers! 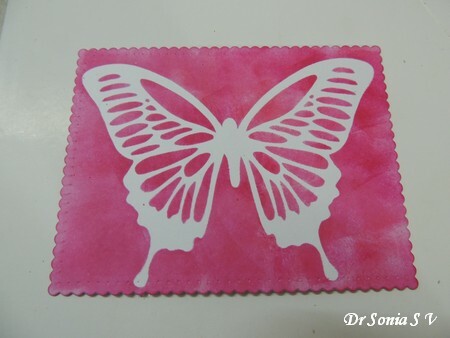 The colorful butterfly panel in various shades of pink and magenta is mounted on a curved piece of cardboard to raise it above the stencilled woodgrain background . 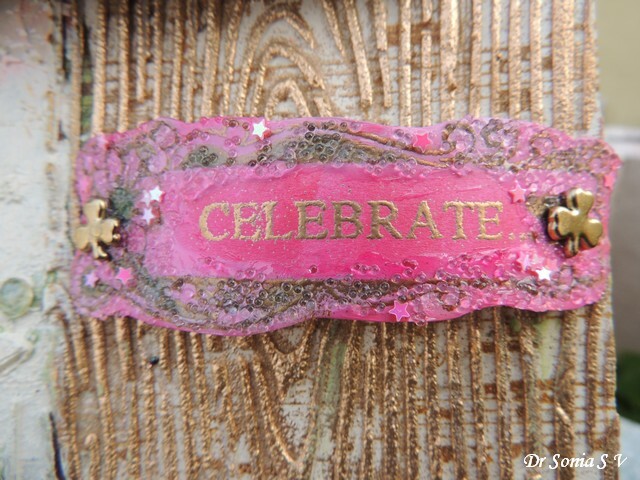 My "celebrate" is also mounted on a curved platform and has tiny shiny star sequins and shimmering translucent glass beads from glass beads gel! 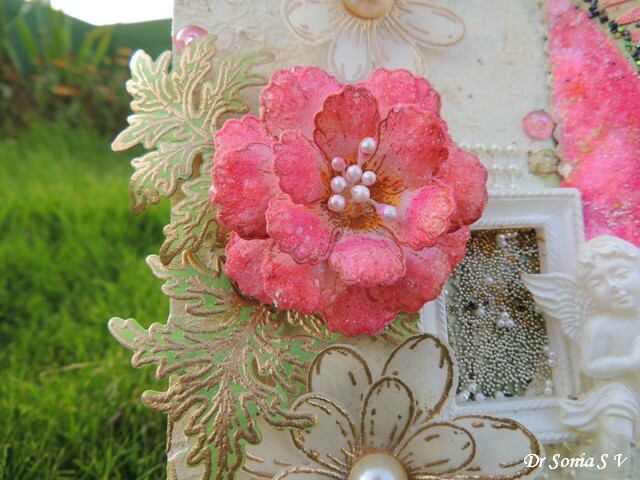 The raspberry pink flower made using Heartfelt Creations Botanical Rose Stamp and die set has a generous sprinkling of distress glitter and diamond dust. 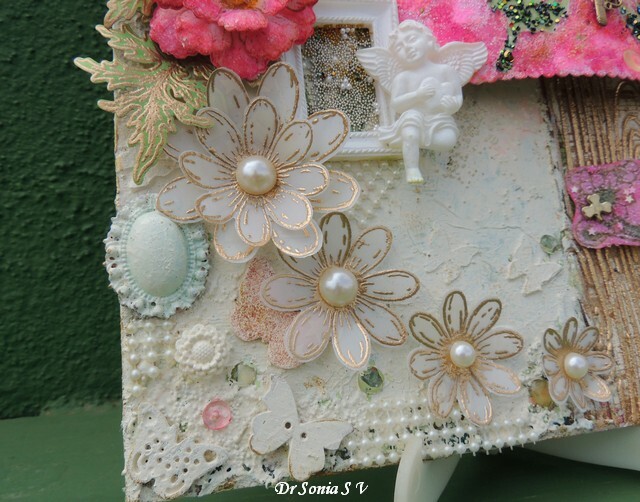 I recycled a sturdy cake base to create my mixed media plaque. 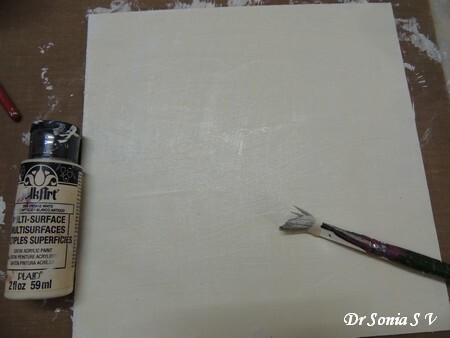 After a nice coat of gesso, painted the base with Folk art Vintage White paint. 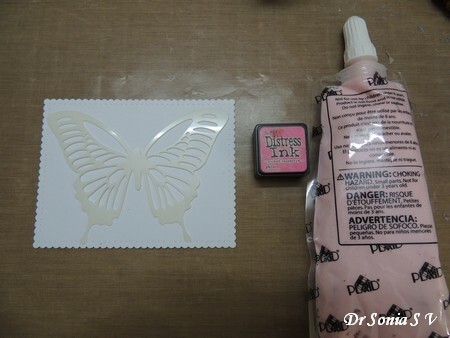 And got the mask of the stencil design! 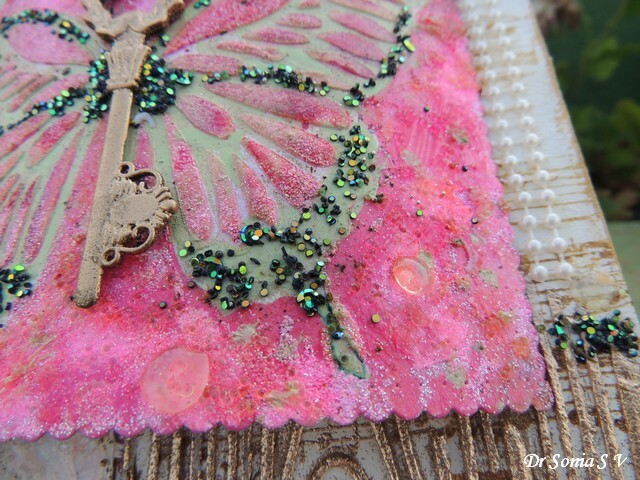 Added splashes of orange with Art Anthology sprays and shiny pink with Wow metallic Pink embossing powder . 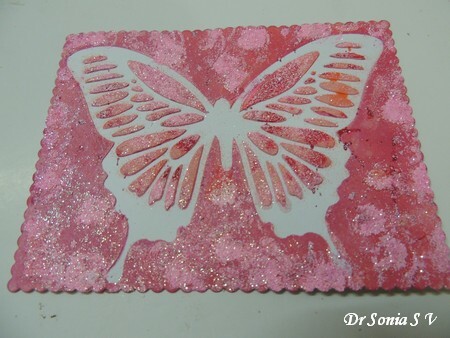 The butterfly was starting to build up in texture and sparkle! 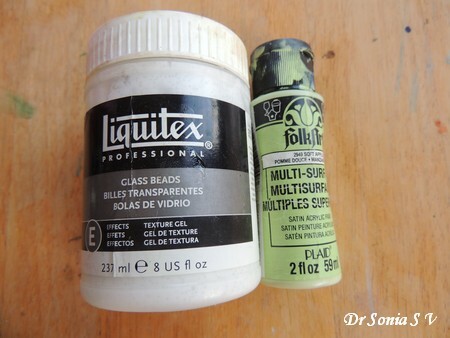 Painted over the whites with a contrasting Folk art Apple green and added more textural elements with glass beads gel. 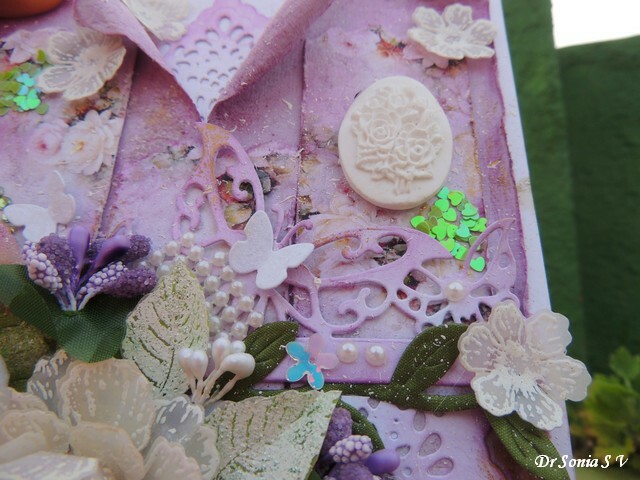 Added more texture with glass Beads gel, chunky glitter and tiny drops of resin! 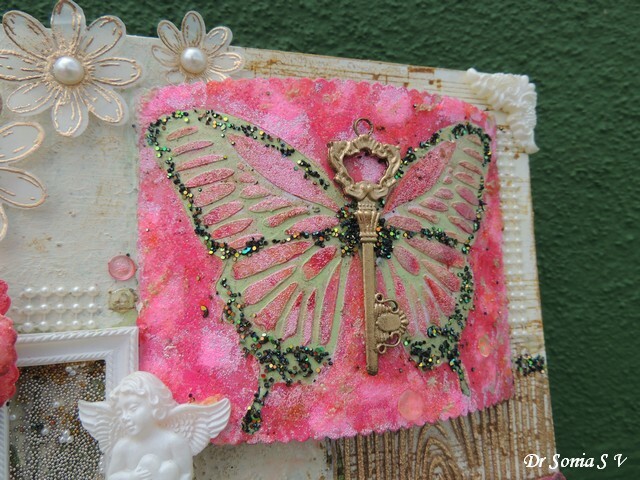 The colorful and sparkling butterfly contrasts nicely with the vanilla and copper gold background ! 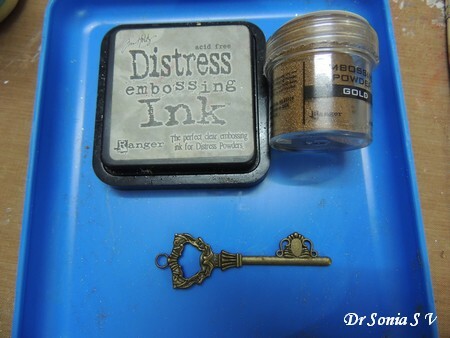 Sprinkled Ranger Gold embossing powder on the wet texture paste and heat embossed to get the beautiful golden wood grain. 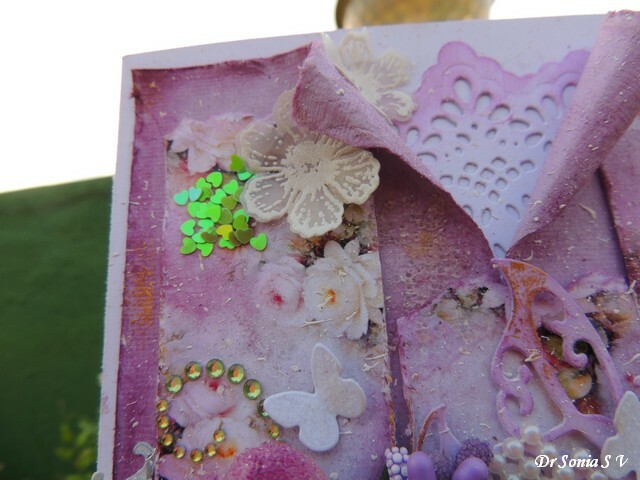 I used the same shades of Distress Inks and embossing powder throughout the project to bring about a cohesive look. 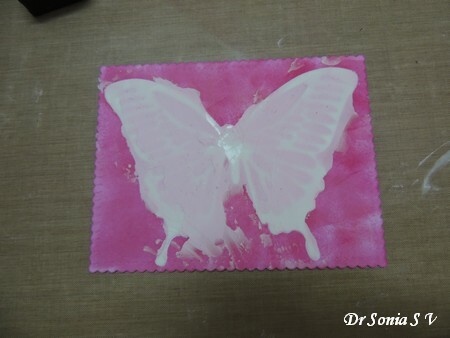 I hope you liked my Mixed Media Decor Piece! 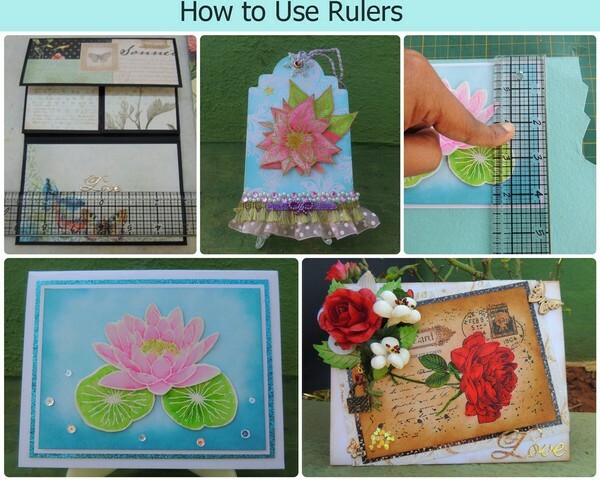 Craft Rulers and How to Use them!! 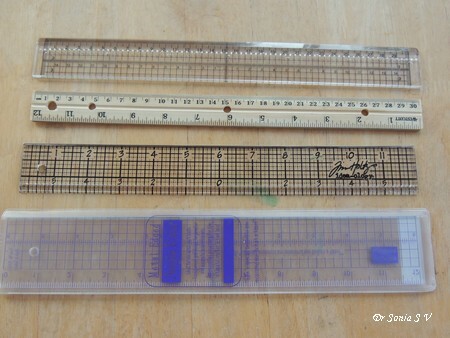 Rulers are one of the most basic of craft supplies ...you and me have used it from childhood. 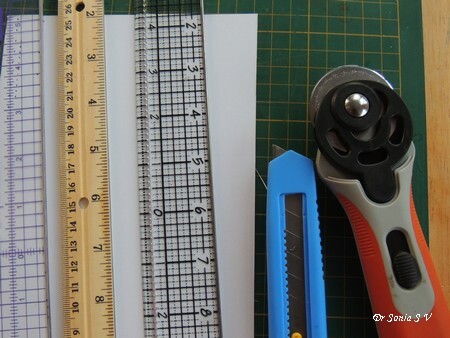 But in this post I am going to be talking about special features of craft rulers that make crafting easier and more fun for us crafters! 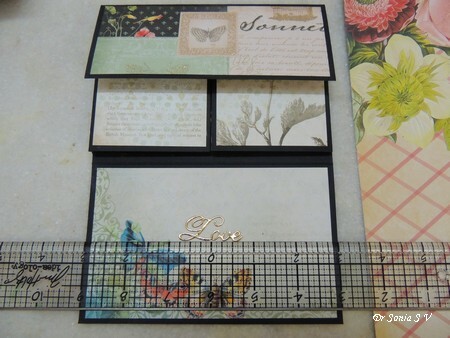 Exploring the various features of craft rulers was both challenging and exhilarating! 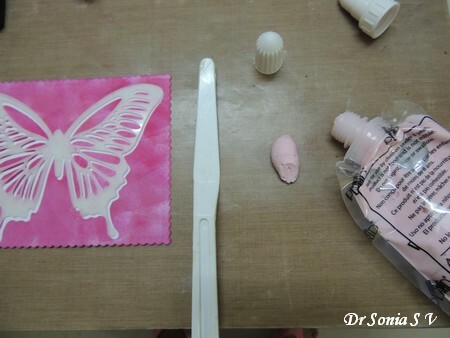 I fervently hope you find this post and the video Tutorial useful !! 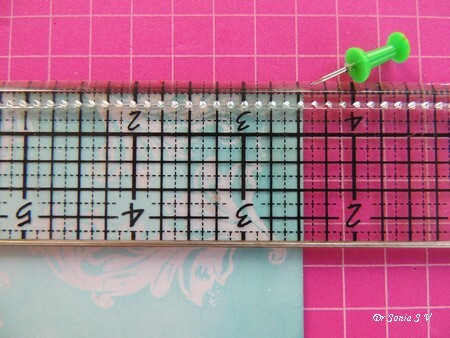 The metal cutting edge is a super useful feature for papercrafters as it allows you to use a rotary cutter or craft knife with a cutting mat to easily and snugly cut along your ruler without slicing off a part of your ruler! 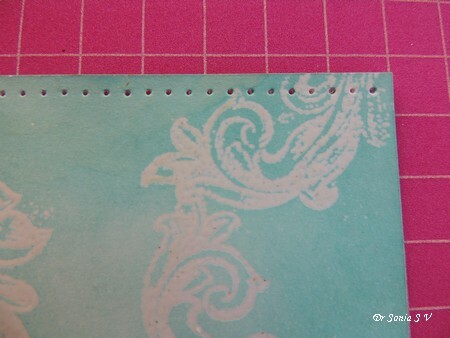 You need to use a cutting mat when using the craft knife/rotary cutter! Being able to see under your ruler is an indispensable feature ! This is the feature I find most useful and its something which you will find indispensable once you start using it! Hanging something precisely requires finding its center point! Adding embellishments at equi distances. Here is a Video Tutorial I made to show you how to use grids and the centering feature.Its my very first video with a voice so please do forgive my mistakes. 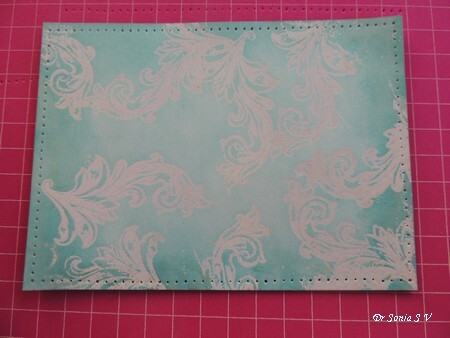 Stitched shapes are the vogue in the craft world right now and there are so many dies which can give the beautiful pierced hole edge feature but how about if you don't have a die cutting machine or want the versatility of being able to create your own customized pierced lines...well then pick up a ruler with the piercing holes feature. 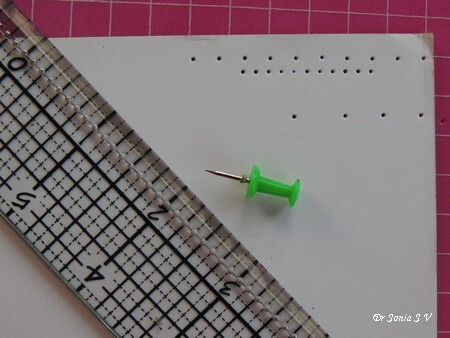 In the Tim Holtz ruler, holes are placed at 1/8 inch intervals so you can create stitch lines on your cards or layouts by using a needle tool [ I have used a humble thumb tack] and a foam base . 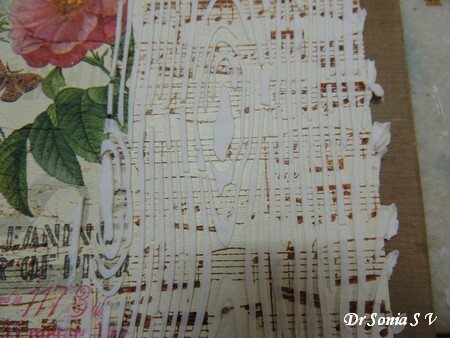 You can create a stitched border all around! And you can play around with the distance and create rows and even create patterns! 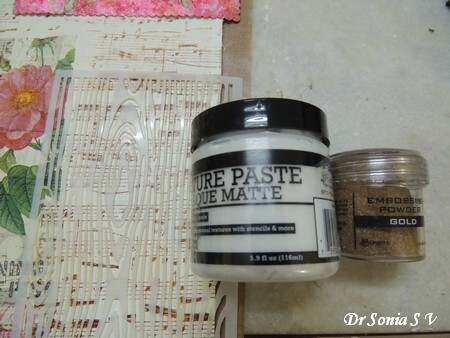 Now that I have discussed the features of craft rulers here are the salient features of different popular brands of rulers. 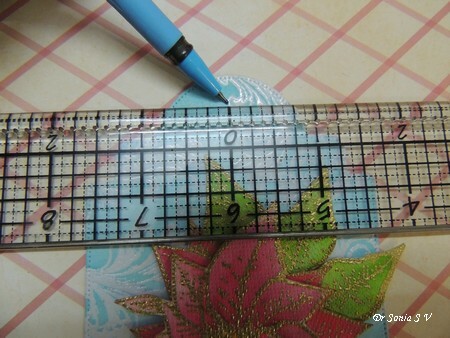 12 inch clear acrylic, centering ruler, with piercing holes, grid and metal edge.Sturdy ruler.My crafter friend Melissa said the markings wore of in hers and she had to get several of these. 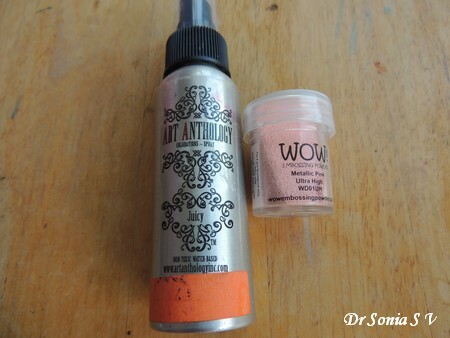 I have been super careful with mine and store it in a foam lined box I made for it so mine is holding up good! Cons : Difficult to use the line where the piercing holes are as it is a difficult to see through in that particular area. Also the 1/4 inch tapered edge on the centering edge was not very easy to use to get a 1/4th inch line if you are using the grid feature to draw let's say parallel lines. This is my personal favorite among the lot! 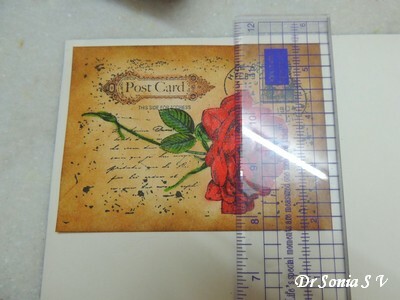 Also comes with a nice plastic cover which you can use to store the ruler and also hang it . 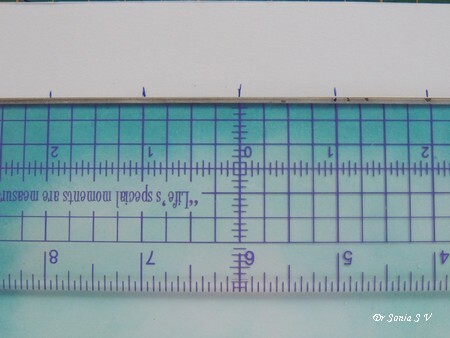 30 cm clear ruler with metal edge , grid, centering feature and piercing holes. You can get centering to millimeter accuracies! 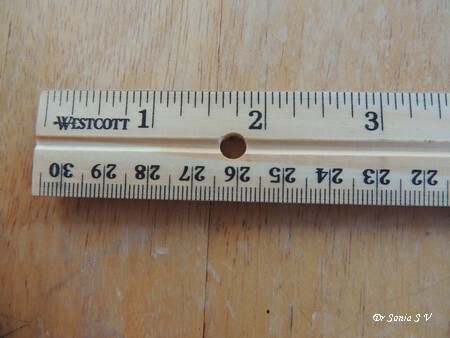 Lightweight wooden ruler which is super cheap costing just 70 rupees! 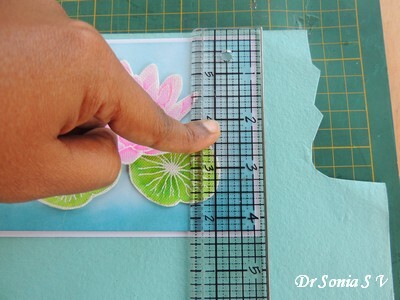 The groove in the center allows you to firmly hold the ruler and press it while you use your craft knife this protecting your fingers and decreasing the chances of the ruler slipping. 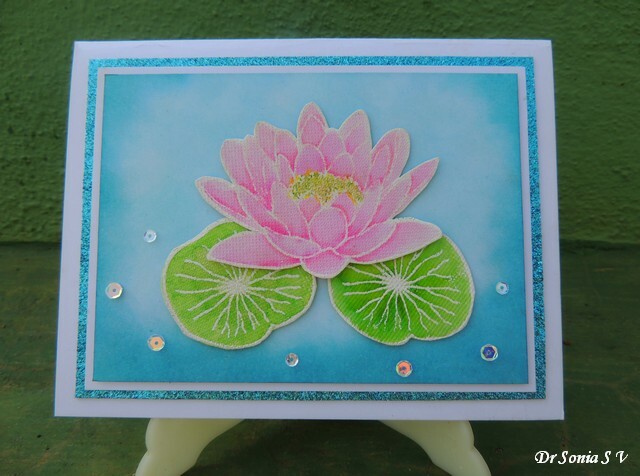 I find making cards for crafter friends very very difficult as I tend to worry too much about whether they will like it since they are crafters themselves and so talented! 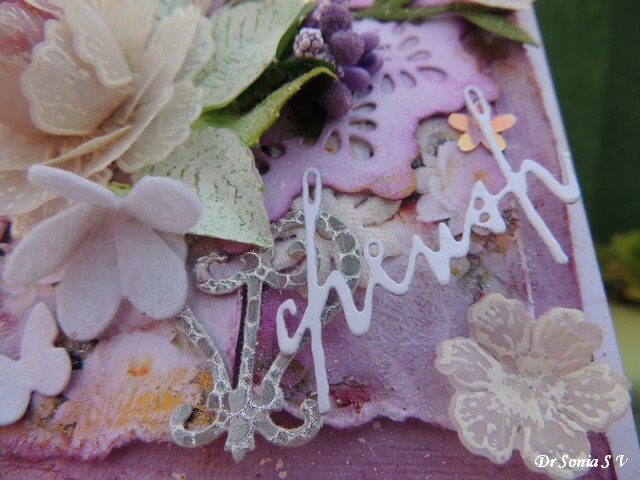 I obsess about every imperfection in my card and finally work myself up to such a level that I end up not sending cards to my crafter friends! 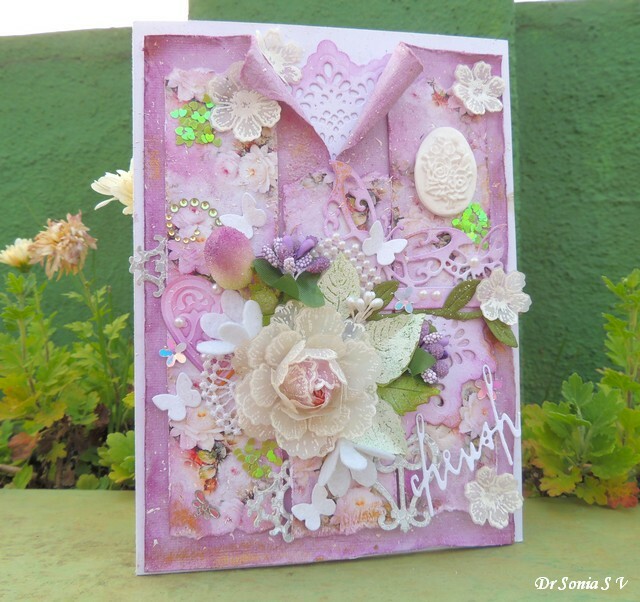 But recently I managed to convince myself that since I myself love all types of cards and loooove receiving cards , that maybe my crafter friends will like my cards too ! 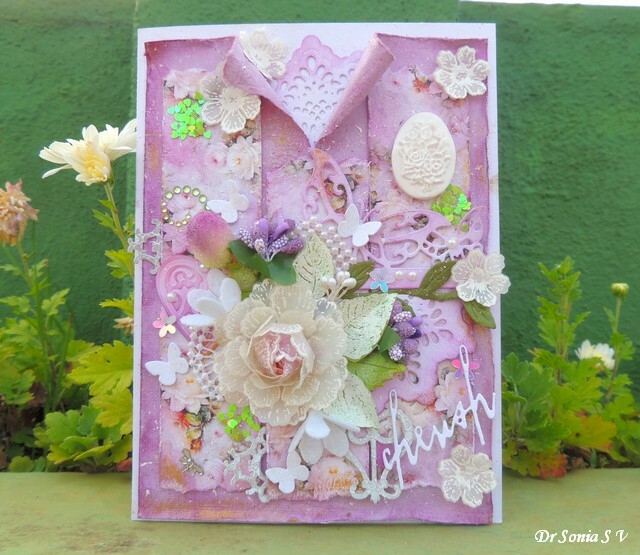 This card has sooo many layers : card stock, handmade paper, pattern paper and lots of die cuts! 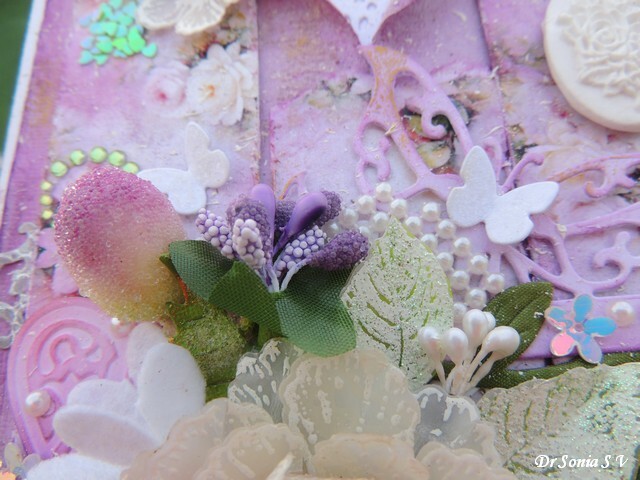 The white oval is a clay embellishment I made and has tiny roses and leaves! 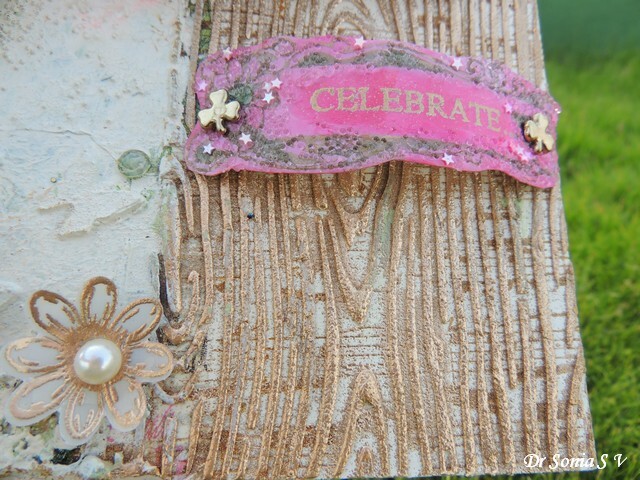 Added texturing with shiny heart sequins, glass beads gel and a splattering of gesso! 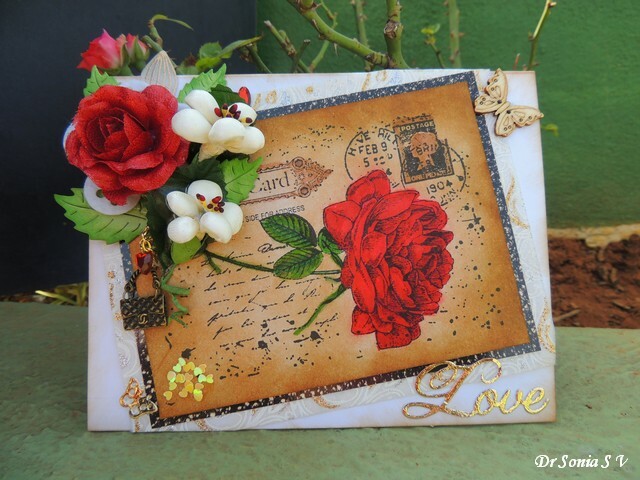 The flowers and leaves were made by stamping on parchment/vellum with various Heartfelt creations stamps. Here is a closeup of a gorgeous crystal dragon fly and in this photo you can also see the shimmer of the inka gold I rubbed on in various places! 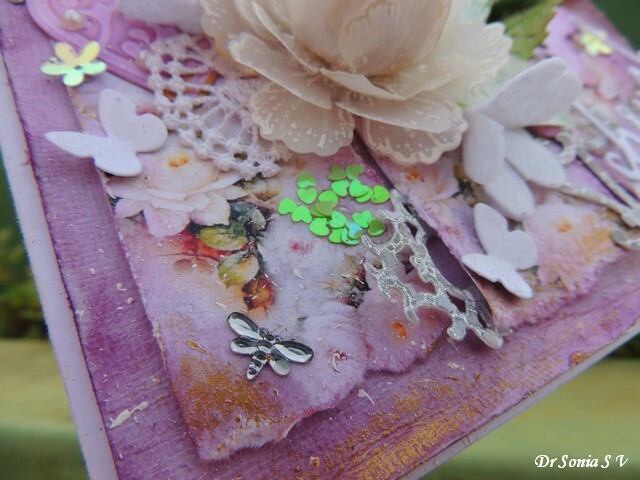 It was a bit tricky to make the vellum rose from layers of heat embossed flowers but then in the end it turned out gorgeous ! What do you think my friends?